In 2010, through observing our spaces as a reflection of self, and perceiving materiality as a significant part of personality and desire, I worked on the series, Public Conversations. In this work I photographed foreign workers in Singapore who have turned common public spaces such as sidewalks and garden benches into their private spaces, due to the lack of personal space in their rented flats. Home ownership, and the huge influx of foreign workers, have become major concerns in Singapore. Touching on the very fragile relationships between foreigners and locals, it explores how use of our shared spaces, reflect upon everyday negotiations and tensions. These issues have led to my latest project, 地平线梦中 (Resting on the Horizon), which explores the delicate balance between tolerance and expression in foreign workers in Singapore. In this work I have requested that a Chinese migrant worker, Ah Zhen, perform an action at a beach in Singapore. He was asked to attempt a rather absurd task: to find sleep on the horizon. His posture reveals a tattoo on his arm, which says 忍 (Tolerance). Ah Zhen had the tattoo made in Singapore. He has only one tattoo, and this will be his last. He will return to China in one or two years. During this time he has spent away from home, he left instructions for his family back home to build his house. He has designed the entire house from scratch. 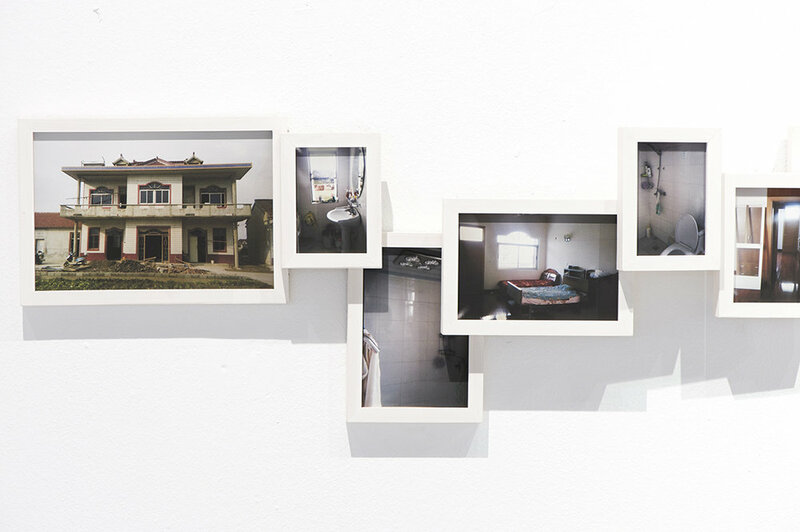 The exterior and interior snapshots of Ah Zhen's home were photographed by his wife back in China, mailed to him, and finally, re-photographed by me. This work explores the precarious status, as well as the aspirations and dreams of migrant workers in Singapore, while challenging our perceptions of “the other” in our society. Installation as part of the FRAC Collection Exhibition at Cittadelarte, Biella, Italy. The FRAC collection (Fondo Regionale Arte Contemporanea – The Regional Fund for Contemporary Art) is stored and displayed in the Museum of the Present here at Cittadellarte Fondazione Pistoletto. The collection is currently curated by Lucrezia Cippitelli.